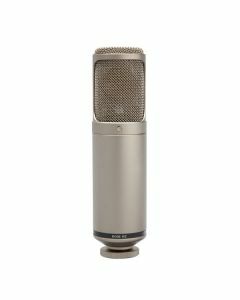 The RODE K2 is a premium valve condenser microphone featuring dual 1” gold sputtered diaphragms. Infinitely variable control of the polar pattern from omnidirectional through cardioid and bidirectional/figure-8 provides the freedom and flexibility to excel in any recording situation. The RODE K2 microphone is designed and made in Australia, and covered by RODE Microphones' industry leading 10 year warranty.